Digital marketing refers to any way in which you choose to market your product or service using digital technologies. When it comes to online digital marketing, think social media, email, and web-based platforms. In contrast with traditional marketing like print, the world of digital marketing is comparatively easy to break into – it’s cheaper, has a wider reach, and gets your message out there swiftly and efficiently. Despite digital methods providing an accessible platform of communication, this does not make digital marketing a doddle. Poorly targeted or badly strategised marketing is as bad, if not worse, than no marketing at all. 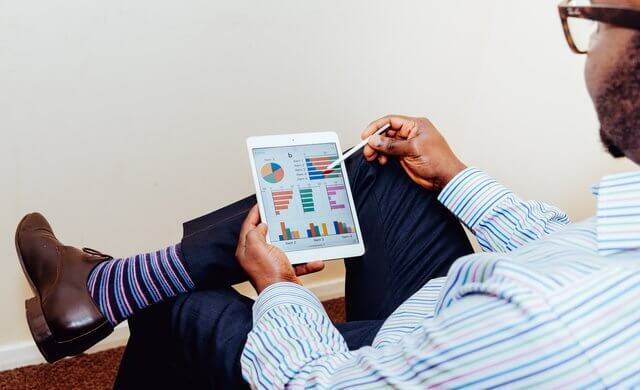 That’s why Startups has put together this helpful guide detailing the types of digital marketing out there, plus the marketing strategies and ideas your small business would benefit from putting into place. As a business owner, you might not be a marketing master. If this is the case, you’re really not alone. Many small business owners highlight marketing as one of the top pain points when identifying the challenges that starting a business brings. We know marketing your business can be an overwhelming prospect, which is why we’ve put together this step-by-step list of marketing ideas for small businesses. Assess what your customers want, and pinpoint what your business does to fulfil that need. This is what you should use as your marketing hook. Take a long hard look at what your competitors are doing to market themselves digitally, and see how you could do it better. Do they use social media? Perhaps they’re keen on email marketing, or maybe they rely on display ads. Whatever it is, pick up on the digital marketing trends within your industry, and learn how to become a big player in your field. If you haven’t already got a business website, now’s as good a time as any to get one. To help you find the perfect website builder, take a browse of the best website builders for small businesses. If you have a website, show it some love. Refresh the content, jazz up the homepage, or even consider creating an online shop to compliment your current sales statistics. A website is what you make of it, and can really boost your sales as well as your presence – both locally and globally. Take a look at this start-up website success story for some inspiration. This’ll help give you a good rep in your industry, and is an easy way to build trust amongst your client base. Google My Business provides a relative level of control when it comes to the external perception of your business. 30% of customers see reviews as key when judging a business, so making sure your review representation is positive is also key. This means listening to your customers and actioning any improvements. Also, take the time to reply to your reviews, positive or negative, as this really shows that you care about your customers and how they interact with your brand. Interesting and worthwhile blog posts work well here, as they will help drive traffic to your site and encourage people to stay once they get there. Put the audience first – Always consider the user intent. Write what the people want to know, not what you think they should be interested in. Tone and style – Yes, grammar is important – so dot your I’s and cross your T’s – but being friendly and approachable communication is also key. Avoid overly complex sentence structures and too much jargon – after all, it’s a blog post, not an essay. Build trust with your readers – Tell the truth. Don’t create wild statistics, and don’t use your website as a platform to slander competitors – that’s not going to win you any favours. Readable and relevant content is the best way to build trust, as it shows that you’re attuned to the wants and needs of your target market. Also, don’t be too sales focused in your copy – be human, be relatable, and be believable. When it comes to building trust, authenticity is the best policy. Whilst written content is what will help your site to rank, the images, videos and overall design of your site are what’ll hook your audience in. Video is a growing digital marketing tool as product demos and advice videos become ever more popular in the start-up scene, with as many as 97% of marketers claiming that video content has improved customer understanding of their product or service. 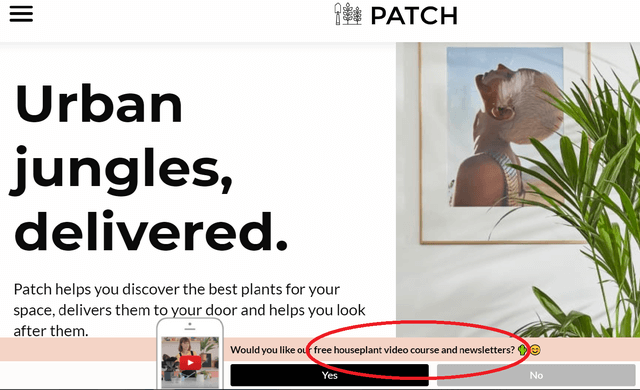 Patch, for example, uses video as a USP, providing specific ‘care’ videos that inform customers on how to look after their plants. Building your SEO presence can lead to a big bump in sales. Google My Business is a huge part of this, as it allows you to put your exact location into Google – literally putting you on the map. Check it out – it’s completely free! You should build up a database of relevant keywords that you can use in your marketing. A keyword research plug-in, such as Keywords Everywhere or SEO Minion, can help you find high-volume words and phrases that your audience are typing into search engines. Using these throughout your website copy will help you rank in search engine results. Despite all this technical innovation, don’t forget the humble email – even today, a well-targeted email campaign is worth its virtual weight in gold. We’ve created a comprehensive guide to email marketing, which will show you how to drive sales from the inbox up. A three-point email campaign is an effective way to communicate with your customers, taking a more ‘softly softly’ approach to marketing a product or service as opposed to the hard sell. Your first email should focus on the ‘what’ – it should introduce the product or service, and create excitement. Exclusive discounts work well – they can help build a personal relationship with the customer, making them feel special, and provide an incentive to buy. Your second email should focus on the ‘why’ – it should build on the excitement generated by your first email. Use a more imperative tone, and really explain why the customer needs this product or service. You can state a reminder that an introductory offer from the first email ends soon. Your third email should focus on the ‘now’ – it should round up the what, the why, and the how much, but place emphasis on how little time the customer has left. Remember that exclusive discount you introduced in the first email? The third email should be sent a few days before the discount ends. It’s a final, final reminder to make the most of the offer, and to check out your fantastic product/service. The social media landscape is an ever-shifting sphere. With constant system updates, changing public opinion, and having to fight to be heard amongst the biggest players in the business world, it can be hard to know what to post, and where to post it. It’s best practice to put your focus on the social media platform that best fits your business outlook, as well as your customer habits. For B2B business marketing, hone in on your LinkedIn and Twitter campaigns. For B2C marketing, Facebook and Instagram are your best bets. The following checklist is designed to structure the early stages of a marketing strategy, and each checklist pointer is designed to formulate a successful strategy as a whole. Brand. Make sure your branding has a clear identity that communicates your business’ USP –think logo, web design, and social media. Most of all, make sure it’s consistent. Know the customer. This means profiling your target market, as not every strategy will fit every customer. Certain products will be targeted at certain people – get to know who they are, and predict what their needs might be. This way, you can really streamline your marketing to impact the most relevant customers. Create Facebook ads. Great for targeting a specific demographic in terms of age, gender, or location, ensuring that the right products are presented to the right prospective customers. Optimise your website. Do your SEO research, and make sure your site is user friendly in its design and presentation of useful information. Email plan. Know what you’re going to say, when you’re going to say it, who you’re going to say it to, and which promotional offers you wish to communicate to your customers. This comes off the back of customer profiling, as not every promotional email you send will be relevant to every client you have. Top tip: Get to grips with Google. The search engine giant receives over 73,000 searches per second on any given day, and when it comes to marketing strategy, it’s every small business’ best friend. Used right, Google can provide a real helping hand when it comes to strategising your marketing, guiding you to business success. 1. Google Analytics – Used for tracking and reporting on your website’s traffic, Google Analytics (GA) tells you which pages on your website are performing well, and which might need some TLC. GA also reports on where your site visitors clicked from, as well as how much time they spend on your site. This is all useful information that you can use to optimise your site. 2. Google Ads – This is Google’s online advertising platform, where you can pay to display ads, services, and promoted product listings. You can even get people to download your app (if you’ve got one). Ads from Google are really good at increasing visibility to areas of your business that really need it. 3. Google My Business – This tool is completely free, and if you’re not already making the most of it, you really should be. Google My Business allows your business to register itself with Google, heightening your chances of appearing in the search results when someone googles you, or something to do with your business. 4. Google Digital Garage – Another one of Google’s free online tools, Google Garage provides marketing training, equipping you with the digital skills you need to grow your business. So far, this article has covered most of the key forms of digital marketing. However – if you can believe it – there are even more out there! Pay-Per-Click (PPC) advertising – Otherwise known as Cost Per Click, the advertiser pays a fee every time a customer clicks on an ad. PPC is essentially a way of buying visits to your website. With search engines such as Google Ads and Bing Ads, advertisers will bid on a keyword that’s relevant to their market. A content site will use a different payment structure, and will usually charge a fixed price per click – this can also be seen on social media sites such as Facebook and Twitter. Social Media Marketing (SMM) – This means using social media as a promotional tool for a product or service. Including anything from a Snapchat filter to running a viral campaign on Facebook, it’s an opportunity to get a bit creative and reach a very wide audience. The overall aim with SMM is to make content that customers will share with their network, increasing exposure and widening customer outreach. Display advertising – This is advertising on a website, app, or social media platform that appears in a banner form. It can be made up of text, images, flash, video, and audio, and delivers general advertisements to site visitors. Your display ad can be part of your PPC marketing – each time someone clicks on your display ad, you’ll pay a fee to whichever platform is displaying the ad for you, be that Facebook, Google, Bing, or any other site with display advertisement capabilities. Small business digital marketing involves planning, strategy, and a variety of digital platforms. It’s essential to streamline any marketing approach, and ensure that the message you communicate is both clear and consistent. Branding, website functionality, and social media visibility are key aspects of any successful digital marketing strategy. It’s also crucial to create content that’s engaging, informative, and shareable. top of the page, and we’ll put you in touch with suppliers who specialise in social media management tools – essential if you want your small business to make a big splash on social media.